Violist Aiden Kane is a Master of Music student at (and a Bachelor of Music alumnus of) the Colburn Conservatory of Music, where she studies with Mr. Paul Coletti. 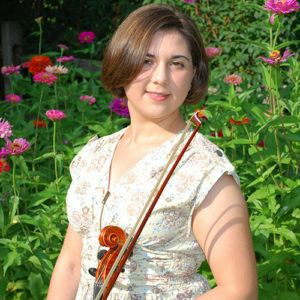 Prior to attending the Colburn Conservatory, she studied with the National Symphony Orchestra’s principal violist Daniel Foster through the orchestra’s Youth Fellowship Program. Ms. Kane is the current violist of the Viano String Quartet, which most recently won 3rd prize at the 2018 Wigmore Hall International String Quartet Competition. She is also the former violist of the Calla Quartet, which was awarded the silver medal at the 2015 Fischoff Chamber Music Competition, and she has worked with Debbie Devine to produce Colburn’s first “Musical Encounters” outreach concert. Last summer, Ms. Kane attended the Perlman Music Program’s Chamber Music Workshop for her third summer and the Yellow Barn Program. Ms. Kane also attended the Mimir Chamber Music Festival and the festival’s Australia residency in 2015 with the Calla Quartet, the Perlman Music Program’s Summer Music School from 2012 to 2014, and the Heifetz International Music Institute in 2011.